An interlocking driveway can take your existing driveway and make it look like a work of art. After all, a driveway can be so much more than a blank sheet of asphalt. You can have beautiful and professionally installed interlocking pavers added to your driveway. Action Home Services is able to design and install custom interlocking driveway designs that will dramatically improve the appearance of your home. If you want your home to have great curb appeal, then an interlocking paver driveway design is the way to go. If you are unhappy with you dull, cracked asphalt driveway and looking to make a change for the better, a paver driveway design can make all the difference. With a wide selection of stone colours to choose from, you will be able to create something truly unique and special to you. If you really want to do something extra special, the Action Home Services team have a great option for you. Our paver driveway specialists are also able to install lighting features along the sides of your driveway. The appearance of your home can be something unique, that will leave guests and neighbours amazed. Another great reason for you to make the switch to a paver driveway design, is that it will continue to look magnificent for many years. It is also very easy to repair if any touch ups are needed. We are always available to you should you have any questions or concerns after we have installed your new driveway. It is our job to make sure that you get the driveway that you deserve. 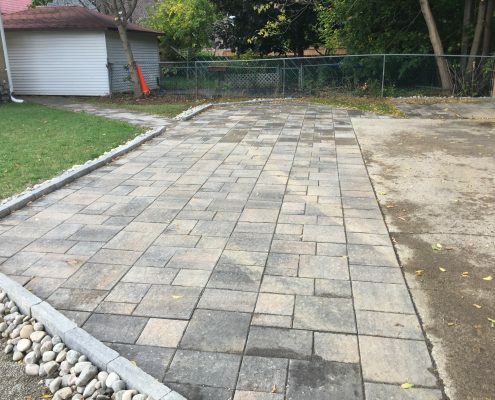 At Action Home Services, we provide interlocking driveway services from the design stage all the way through to completion of the project. 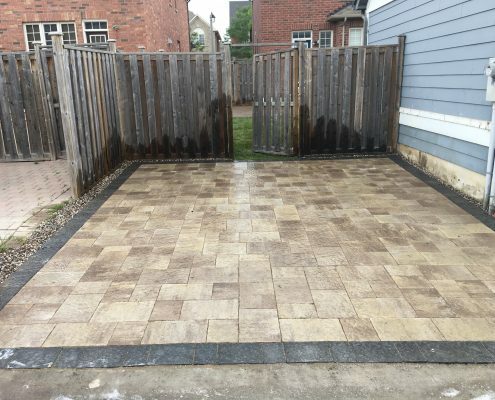 After meeting with you, we become invested in the project and our trained employees use all of their practical experience to make your dream driveway a reality. Not only will your interlocking paver driveway look beautiful and add value to your home, it will also function as a driveway. Allowing you to drive and walk on it with confidence. Knowing that your new driveway was built to exceptionally high standards by the very qualified and experienced team at Action Home Services is a great feeling that all of our satisfied customers enjoy. We take great pride in the work that we do. It is a badge of honour for us that many of our customers will often recommend us to their friends and colleagues and also ask us to work on other aspects of their homes after we are finished installing the interlocking driveway. As we have worked with many homeowners, we have learned the vital importance of finishing a project to an agreed upon deadline. We know that you are busy and that you rely on the use of your driveway on a day to day basis. This is why we work had to make sure that we deliver the high-quality workmanship that we are known for, as we complete the project in an efficient manner. Action Home Services is an experienced and certified interlocking contractor serving Toronto, Markham, Vaughan, Thornhill, Concord, Bradford, Scarborough, Brampton, Mississauga, Burlington, Oshawa, Richmond Hill, Milton, Oakville, Aurora, Caledon, Pickering, Whitchurch – Stouffville, Ajax, Whitby, New Market.